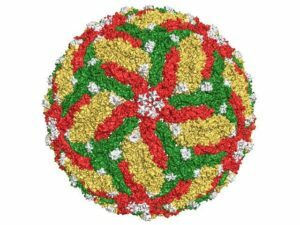 Mapping of a principal neutralizing epitope (shown in white) on the surface of Zika virus. An international team of scientists, led by Northwestern University Feinberg School of Medicine, has determined the 3-D atomic structure of more than 1,000 proteins that are potential drug and vaccine targets, to combat some of the world’s most dangerous emerging and re-emerging infectious diseases. These experimentally determined structures have been deposited into the World-Wide Protein Data Bank, an archive supported by the National Institutes of Health (NIH), and are freely available to the scientific community. The 3-D structures help expedite drug and vaccine research and advance the understanding of pathogens and organisms causing infectious disease. Before work begins on a targeted protein, a board appointed by the NIH examines each request. Once approved, the protein must be cloned, expressed and crystallized, and then X-ray diffraction data is collected at the Advanced Photon Source at Argonne National Laboratory. This data defines the location of each of the hundreds or even thousands of atoms to generate 3-D models of the structures that can be analyzed with graphics software. Each institution in the Center has an area of expertise it contributes to the project, working in parallel on many requests at once. Until recently, the process of determining the 3-D structure of a protein took many months or even years to complete, but advances in technology, such as the Advanced Photon Source, and upgrades to computational hardware and software have dramatically accelerated the process. The Seattle Structural Genomics Center for Infectious Disease, a similar center funded by NIAID, is also on track to complete 1,000 3-D protein structures soon. Browse all of the structures deposited by the CSGID. Anyone in the scientific community interested in requesting the determination of structures of proteins from pathogens in the NIAID Category A-C priority lists or organisms causing emerging and re-emerging infectious diseases, can submit requests to the Center’s web portal. As part of the services offered to the scientific community, the CSGID can also provide expression clones and purified proteins, free of charge. This project has been supported by federal funds from the NIAID, NIH, Department of Health and Human Services, under contract numbers HHSN272200700058C and HHSN272201200026C.